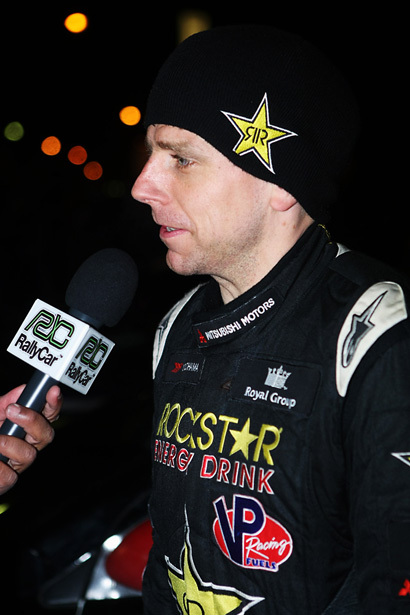 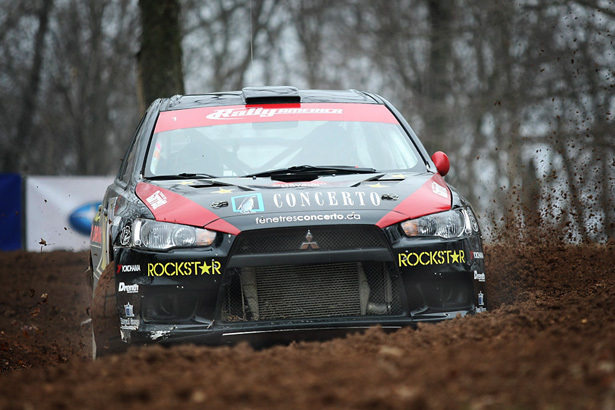 2010 North American Rally Cup champion Antoine L’Estage and co-driver Nathalie Richard of the Rockstar Royal Group Rally Team go head to head against their biggest rival, Subaru Rally Team USA’s Dave Higgins in the 2011 STPR. 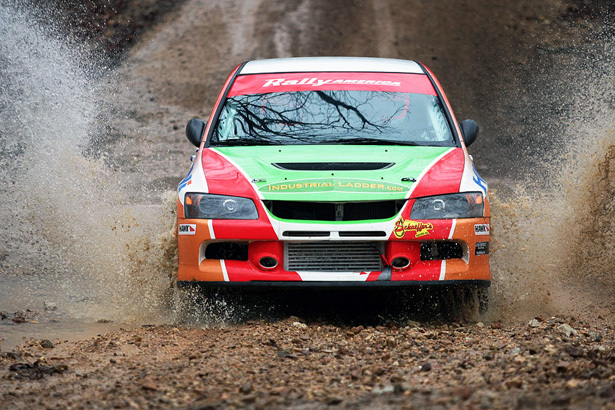 The Waste Management Susquehannock Trail Performance Rally is the fastest car rally in North America. 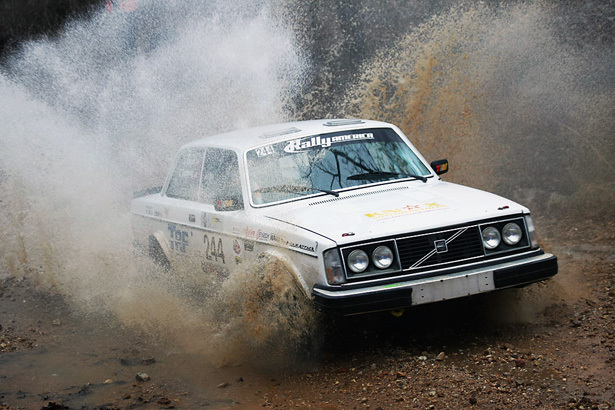 Its a high adrenaline pressure cooker packed with action, thrills and bone crunching stakes. 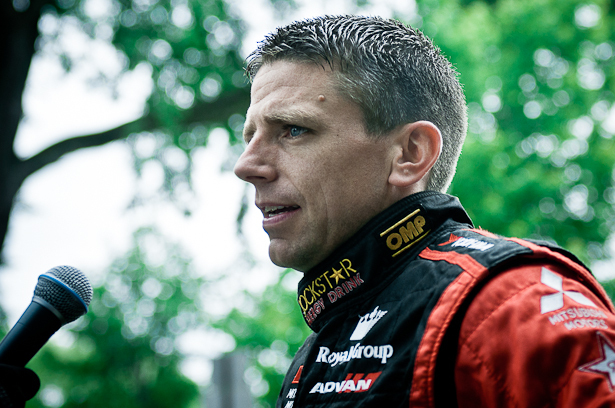 Special thanks to Filip Terlecki and Martin Terlecki for awesome DSLR video footage, direction and production. 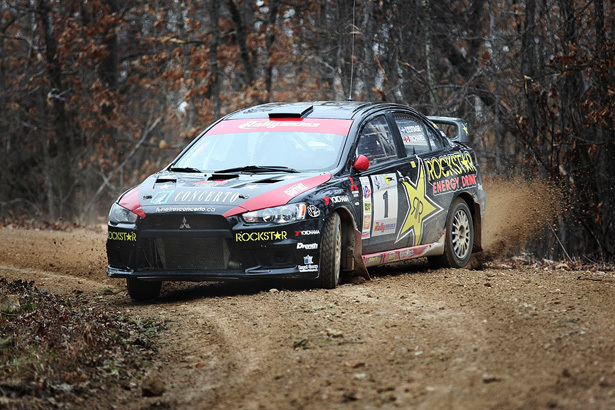 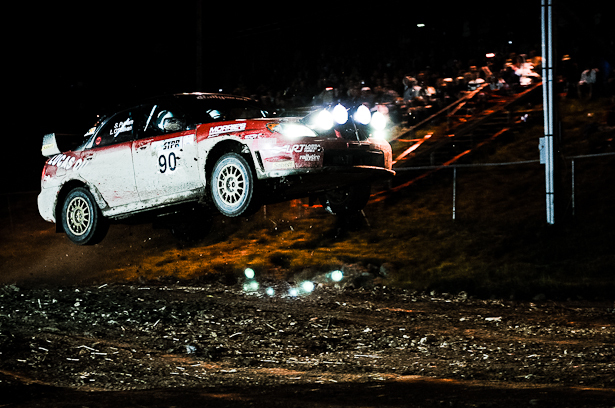 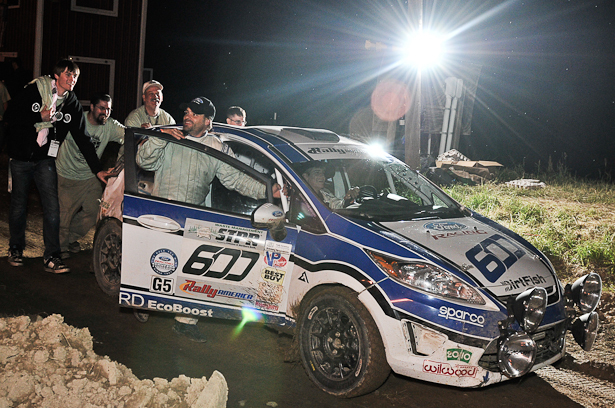 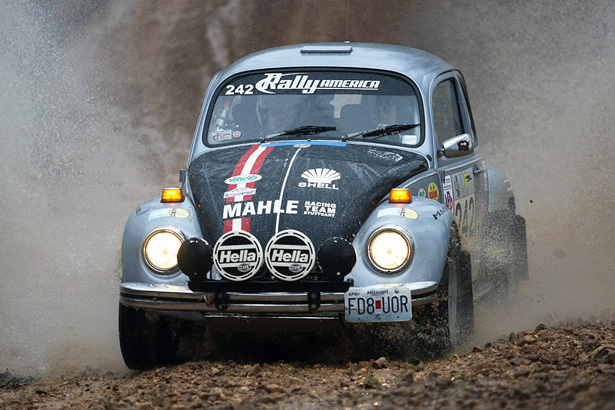 The 2011 Susquehannock Trail Performance Rally (STPR) came to a nail-biting finish. 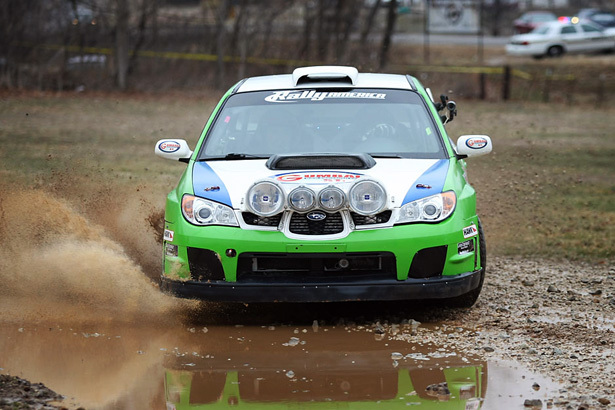 After 120 stage miles Subaru Rally Team USA’s David Higgins beat the 2010 Rally America Champion Antoine L’Estage by a mere 1.3 seconds. 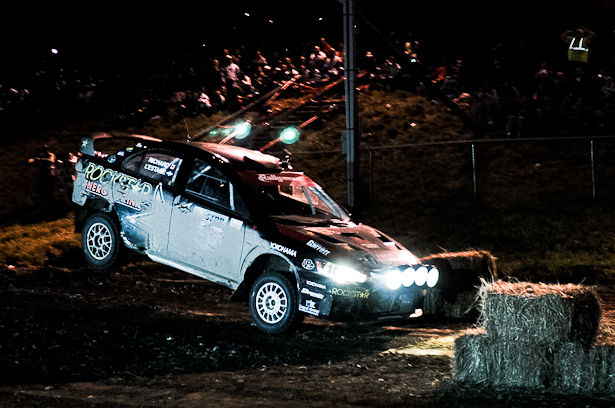 The grand finale took place at the Tioga County Fairgrounds Super Special near Wellsboro, Pennsylvania. 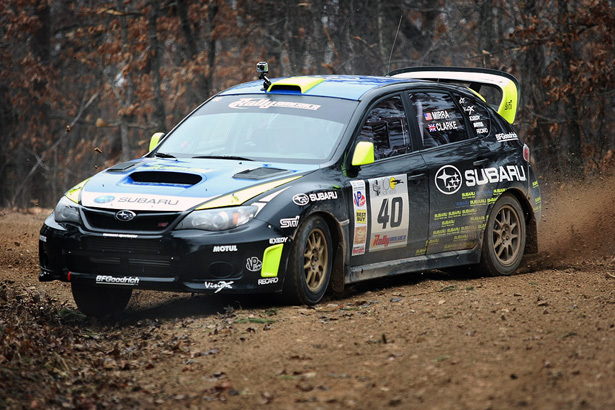 Higgins and L’Estage battled throughout the event with the Subaru driver coming back from a 37 second deficit at the end of day 2. 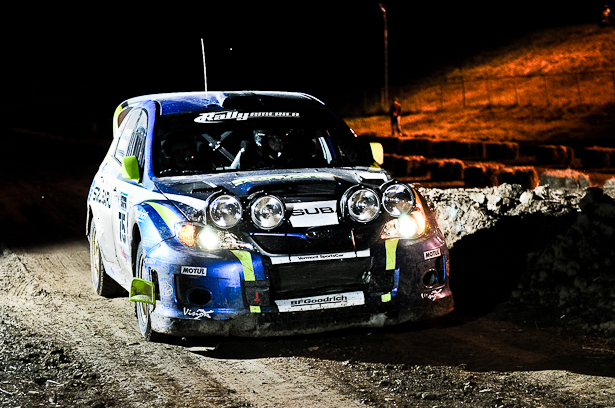 Ramana Lagemann and co-driver Chrissie Beavis took 3rd place in their Super Production 2011 Subaru Impreza STI. 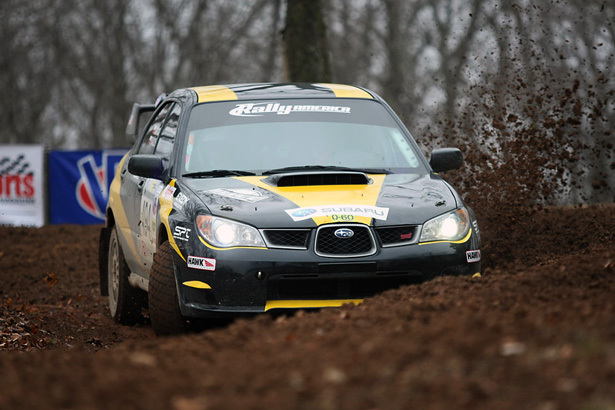 Travis Hanson and Terry Hanson placed 4th in their Super Production 2007 Subaru Impreza WRX STi. 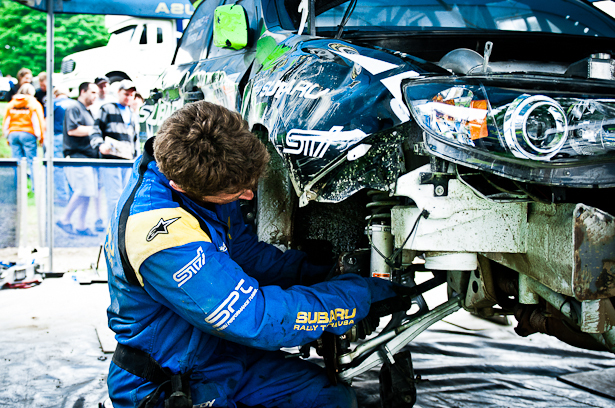 Subaru Rally Team USA driver David Mirra suffered an accident caused by a pace note error, but managed to drive his Impreza STI to the finish and snatched the 5th place. 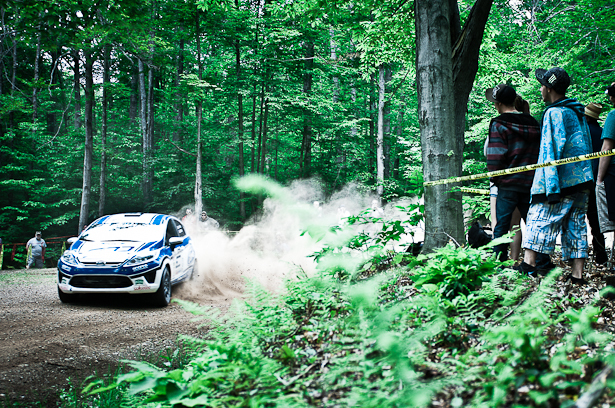 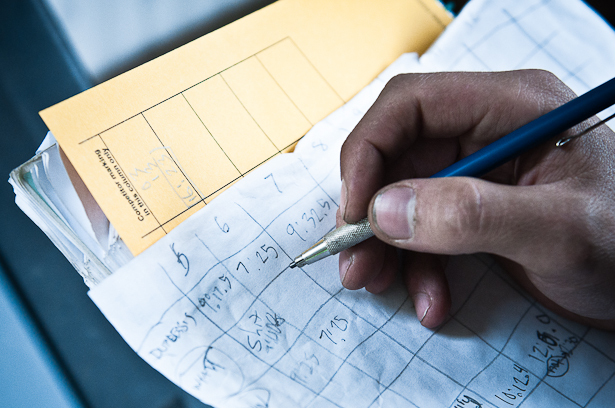 Take a look at a couple of images from STPR 2011 below and stay tuned for a short documentary-style film about STPR’11. 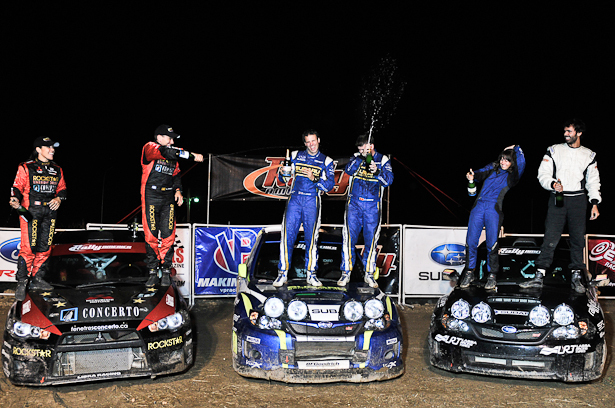 Subaru Rally Team USA's David Higgins & Craig Drew, STPR 2011 winners - ©Peter Calak, Gravity Bureau Inc.
Subaru Impreza jump at Tioga County Fairgrounds Super Special - ©Peter Calak, Gravity Bureau Inc.
SRT USA Craig Drew & David Higgins - ©Peter Calak, Gravity Bureau Inc.
STPR 2011 winners: Higgins, L'Estage and Lagemann - ©Peter Calak, Gravity Bureau Inc.
David Higgins & Craig Drew, 2011 Subaru Impreza WRX STI - ©Peter Calak, Gravity Bureau Inc.
Pennsylvania Grand Canyon, home of the STPR - ©Peter Calak, Gravity Bureau Inc.
Antoine L'Estage & Nathalie Richard gravel drift - ©Peter Calak, Gravity Bureau Inc.
Antoine L'Estage interview at 2011 STPR - ©Peter Calak, Gravity Bureau Inc.
Antoine L'Estage jump at Tioga County Fairgrounds Super Special - ©Peter Calak, Gravity Bureau Inc.
Nathalie Richard at STPR 2011 finish - ©Peter Calak, Gravity Bureau Inc.
Dillon Van Way & Jake Blattner in a 2WD Ford Fiesta - ©Peter Calak, Gravity Bureau Inc.
SRT USA mechanic repairing Dave Mirra's 2011 Subaru Impreza WRX STI after a roll-over - ©Peter Calak, Gravity Bureau Inc.
Co-driver taking notes at STPR 2011 - ©Peter Calak, Gravity Bureau Inc.
SRT USA service crew fueling Dave Mirra's STI - ©Peter Calak, Gravity Bureau Inc.
Dillon Van Way & Jake Blattner pushing their 2011 Ford Fiesta at the 2011 STPR finish - ©Peter Calak, Gravity Bureau Inc.
Travis Pastrana made an unexpected appearance at the 2011 100AW Rally, but unfortunately crashed his Subaru Impreza WRX STI on the first super stage. 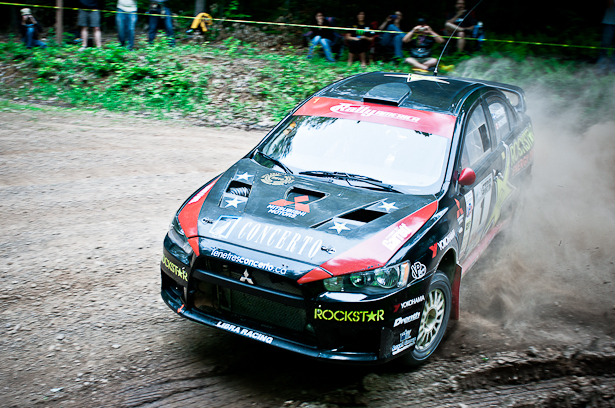 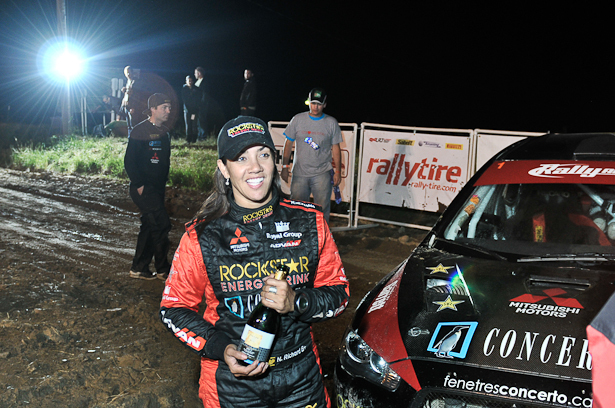 Antoine L’Estage and Nathalie Richard led the rally in their Mitsubishi EVO X and finihsed on the podium. 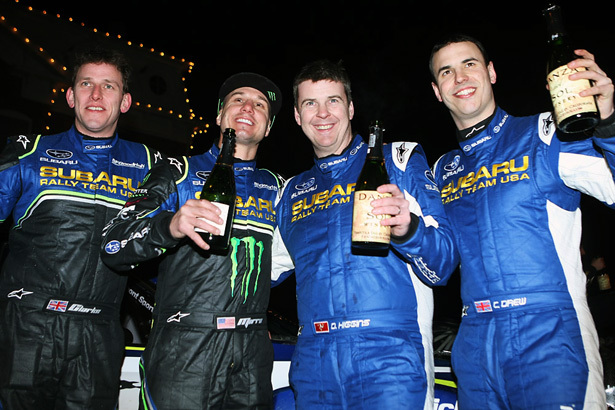 Davis Higgins and Dave Mirra sponsored by Subaru Rally Team USA finished in second and third place. 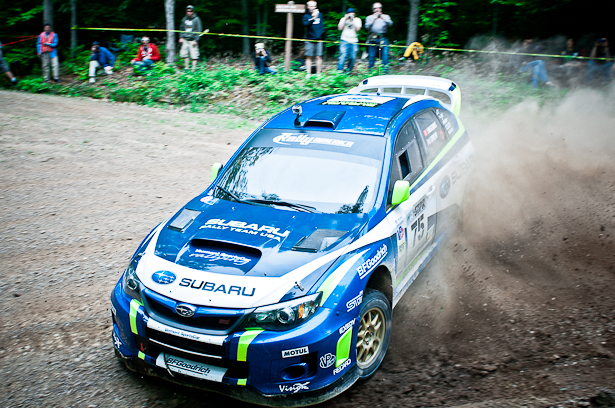 Travis and Terry Hanson placed fourth in a Super Production Impreza STI.